That's the proof for the theory of parallel worlds, right there. The bleed-over point must be close to Stamford Bridge. 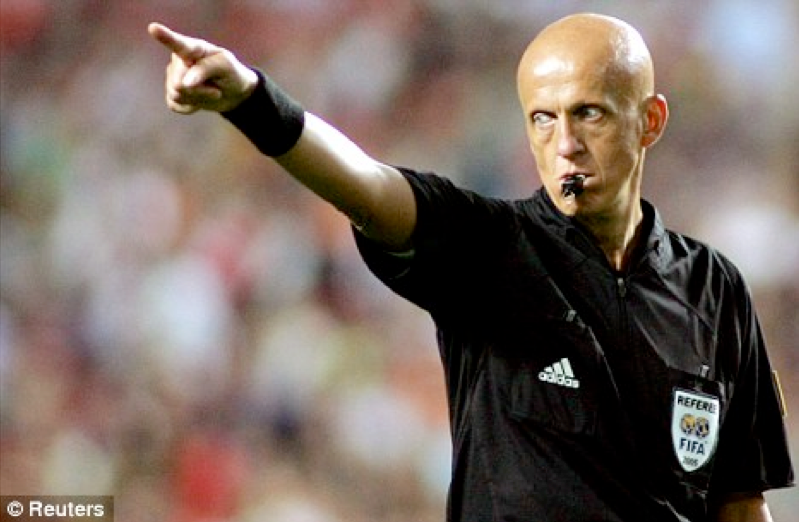 Manchester City have given three points back to Chelsea after being caught red handed 'faking the result'. Chelsea boss Jose Mourinho declared after Sunday's game at The Etihad that the 3-0 scoreline was 'fake', as reported by the BBC and his side deserved to win. In a remarkable turn of events, Manchester City manager Manuel Pellegrini has admitted his team did just dominate Chelsea for 'banter', and has apologised and promised not to do it again. He definitely did not say: "Jose's comments stung us hard. We worked all week with referee Martin Atkinson to come up with a ruse which would help Fernandinho look like a world class player. "Unfortunately there was a leak and it appears Cesc Fabregas was in on it too. He took it too far. "I'm worried for Jose though, he looks stressed. May be he should see a doctor?" Jose Mourinho has since lodged a request with the Premier League and Manchester City to sanction a swap deal for Sergio Aguero and Radamel Falcao. Asked for his thoughts on the fake result, Arsenal boss Arsene Wenger did not say: "I didn't see it, but Jose has been faking wins over me for years. What's all the fuss about?" You should have your own column, Dave. You could tell it wasn't a davet010 original by the lack of expletives or suggestions of an anatomically-impossible nature. Ah, well at least you came clean. I thought maybe the subject matter was too easy to require expletives this time around. "Diego Costs is a f*cking mard tw*t"
When I think of davet010 originals I think of the pet names of players you hate, like 'Shrek' for Wayne Rooney. Sterling sure fits right in with City's attacking players, doesn't he? Didn't seem to get in the space of others, offering width and running at defenders at pace they may have been lacking a bit last year. Apparently it was like that straight away in pre-season, but with pre-season being pre-season you never really know. What would you expect from a match report written by the teams involved? Finally we can both REALLY agree on something. I really liked what you said comparing Aguero, a class player, with Costa. Because all Costa has done this season so far this season is pick fights. Seems to have completely forgotten about the goal scoring from last year. EDIT: Everton seem to be in for Yarmolenko. This is terribly exciting for me, and I shall now commence drinking in pre-celebration. As far as Diego Costa goes, anyone who's seen him in his La Liga days will know that this season's version is much more like the Costa of old - a cheating bag of sh*t who'll alternate between sly little kicks and throwing himself to the ground waving pretend cards. A friend pointed out that Costa was potentially lining up for a sly dig at Fernandinho on Sunday as the players went off at half time, before Mangala 'accidentally' interposed himself. I don't like Costa. He takes cheap shots, and falls to the ground if someone looks at him wrong. Last year he got some favorable calls, and he also scored goals and caused problems. He seems to be causing more problems for his own team this year, though I know we are only two games in. Falcao and Remy haven't looked great either. Curious if these are actual problems, or just some rustiness. Love that Lukaku is portrayed with the fan be accidentally clocked. (Context, for folks who didn't see the story). Agreed that Costa is a piece of work. Would love to see him and Mourinho fall out and start blaming each other for Chelsea's struggles. Maybe Chelsea's locker room could serve as an ad hoc Thunderdome? Get ready for the "we were never really after Pedro anyway" quotes from United - he's signing for Chelsea. Apparently. Because they are really short of midfielders. United fan I work with (don't worry, I'm in Saudi, so he's not breached the 'does not live within 100 miles of The Swamp' rule) assures me that it was all a smokescreen to allow them free run at Thomas Muller. Mmm, yes. That's obviously what happens when you stand outside for a couple of hours at 45c. Well, that's still better than all your offers for De Bruyne being a smokescreen for not signing De Bruyne. Window's not over yet, sunshine. Shame Cabella never got a chance to shine in the middle for Newcastle, but he's gone to Marseille now after an unimpressive single season. 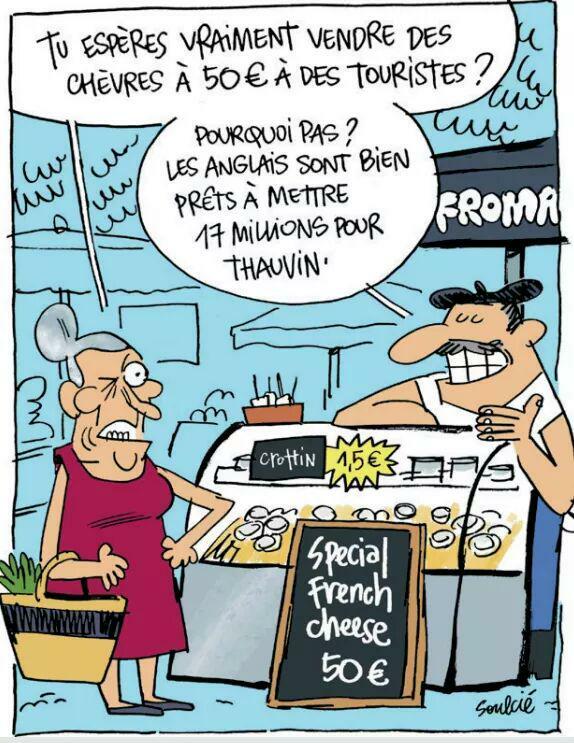 "You really hope to sell cheese to tourists for €50?" "Why not? The English spent €17m on Thauvin"
I don't know much about Thauvin (haven't even tried to look up his stats) but I'm skeptical that the difference between him and Cabella is worth £12m, less what you expect to get selling Cabella to Marseille next summer. The English press seem to be hyperventilating over Jonjo Shelvey after two games this year. Since moving to Swansea he's been a good player and he did play very well in the first two games but it seems a bit much for the New (English) Charlie Adam. United have already posted their side for this week's match. Much to the surprise of their supporters, who believe that everyone still dreams of playing for them. Why put up a whole statement if all you have to do is say YEAH SURE YOU SIGNED UP ANDY CARROLL YOU MUG. Perhaps because Bournemouth don't have the resources to pay out 15m for one player and then gamble on getting 10m back for him - if he has a poor season, no one is going to think he's worth 10m. Bear in mind that their entire turnover last season probably wasn't 15m, and the TV money comes in instalments, I'm guessing. No, if you're going down anyway, 5m is a better punt that 15m out and maybe 10m back. I'm thinking wages maybe lower as well. I think Bournemouth could afford Austin's fee without a problem, but the wages if they were to get relegated would probably be a big issue. The prospect of paying wages that apparently put Newcastle off to a player for 3 or 4 years in the Championship is something I'd want to avoid if I were Bournemouth. Whether it's a decline in performance or a major injury being the cause of getting stuck with him I don't think that's a risk a club like Bournemouth can afford right now. £5m for 31 year-old Glen Murray seems pretty dumb to me though. This summer's Rickie Lambert transfer I guess. I don't see Murray doing a lot to help them stay up. I'd take a shot at Balotelli on loan before giving Murray a multi-year contract but my Mario soft spot is probably blinding me. Probably been hit in the eyes by too many shots from 25+ yards out. The biggest issue with Austin is the fact his contract is up at the end of the season. I think he'll leave this window though, QPR are just putting that figure there to see if anyone will stump it up before deadline day, and with the new TV deal coming into play from next season, he is valuable to them. Dave, I get your point, but any team that got promoted to PL has to have this kind of money to burn. Singing one 15-20 million player after getting promoted from Championship was how I've always rolled in FM. As well as Muller, obviously. Stop laughing at the back ! This "under the radar" bid was probably so under the radar that Woodward neglected to mention it even to Barca executives. Safer that way. I'm sure Woodward will get around to bidding on Neymar if Neymar's release clause gets bumped up from whatever ridiculous symbolic figure it already is. I can't believe he's still at Manchester United after how he handled the Fellaini transfer. Obertan is starting again for Newcastle today :(. I like the guy as a player, for a club of Newcastle's stature he's a decent guy to have as your 4th-best wide player, but starting him again and again is madness. "Yeah, didn't really want that Pedro - he wouldn't get a game in front of Ashley Young anyway". Coming next, how Woodward didn't bid for Messi because they've already got a world class striker in di Mar...err, van Pers....err, Shrek. And wait for the heart-rending tale of how Naymar used to kick a ball against the wall of Old Trafford on his way home from Stretford High School via Lou Macari's chippy. File it next to the 'Depay is the new George Best' quotes (2 Prem games, 0 goals, 0 assists...maybe the comparison is that he's working his way through a second liver a la Bestie). Shame we couldn't get the 3 points as well with some good chances from Mitrovic and Cisse at the end. Excruciating final 15 minutes to watch, but hopefully this kick starts our season. Yeah - United's strikeforce of Mr o.g and Mr massive deflection didn't put in a shift today. Not even the introduction of the World's Best Substitute (Hernandez, per Michael Owen) could enable a goal. 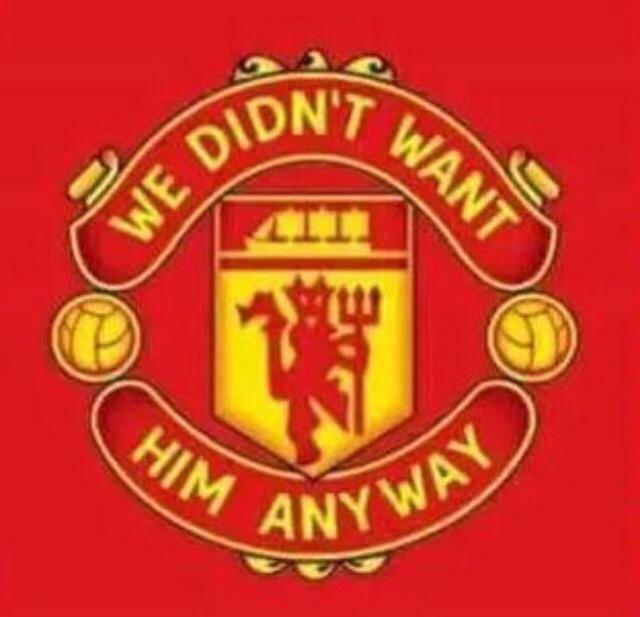 Still, they did release the photos of their new badge.